Barks created this painting for the cover of Funnyworld 16. On this cover, the text "Our student witch is a funny animals freak" is quoted under the painting. The derby-hatted ogre Smorgasbord ressurrects an old idea, taken from an (at that time) unpublished sequence of Trick or Treat. 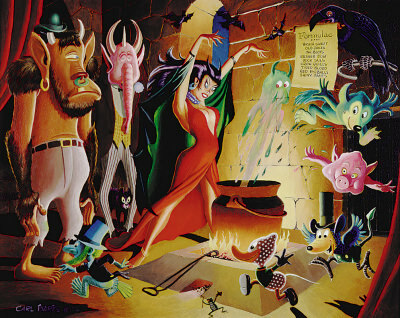 Carl Barks completed the oil painting Student Witch in 1974. In 1997, Edition 313 reproduced the first copies true to the original as a continuous, seven-color lithograph. It was printed on acid free, cotton fibre paper at the von Stern'sche printing works in Lüneburg (Germany). As an additional protection a UV varnish has been applied to the print's surface. This guarantees resistance aging, fading or yellowing for centuries if stored under normal conditions. Carl Barks handsigned all the lithographs issued by Edition 313. These are strictly limited and neither Dreidreizehn nor any other printing houses will be able to publish them as Carl Barks's hand signed editions. Immediately after the completion of the print run, all printing plates were destroyed. 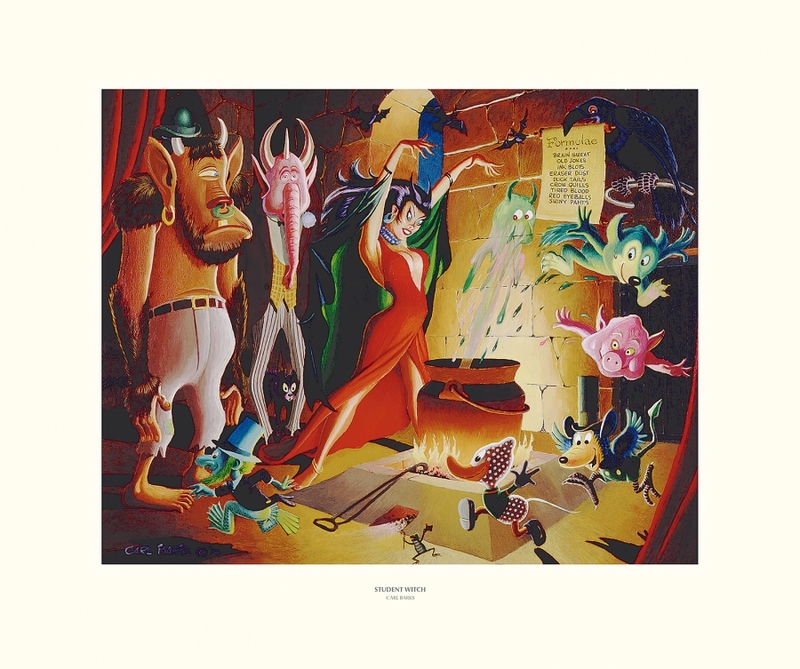 Carl Barks signed the lithographs Student Witch at Grants Pass, OR (USA) in October 1997. The print run consists of only 313 copies for world-wide distribution. In addition, 13 artist's proof copies (AP) held by Carl Barks were printed. Adjunctive to Carl Barks's pencilled signature and the individual numbering, all lithos are specifically marked with two stamped embossings; the image area is surrounded by a 1/4" band and at the left hand bottom corner the logo of Edition 313. Student Witch is the fourth lithograph of the Edition 313, issued Christmas 1997 by publishing house Dreidreizehn, Lüneburg (Germany).